This Sweet Potato Streusel Bake is for you if you are looking for an easy, better-for-you, gluten-free, sweet treat to add to your holiday table. With aromatic, inviting and warm spices like cardamom, cinnamon, and ginger, this is one dish that your family and friends are sure to love. I realized what I had been missing! Why I love my Anolon®Accolade Set! Anolon® skillets come with thick bases, slimmer walls, and ultra-tough rims that provide for fast and even-heating without any disfiguring. They are constructed from hard-anodized aluminum [using patented Precision Forge™ technology] for ultimate durability. I can use my Anolon® skillet on my stovetop, in my oven (safe to 500°F) and then wash it off in my dishwasher! I can use my metal spatulas in my Anolon® cookware as their sapphire-reinforced, triple-layer nonstick is metal-utensil safe! Anolon® cookware comes with stainless steel handles with easy-to-clean flat rivets – yay for no more protruding rivets that get dirty. 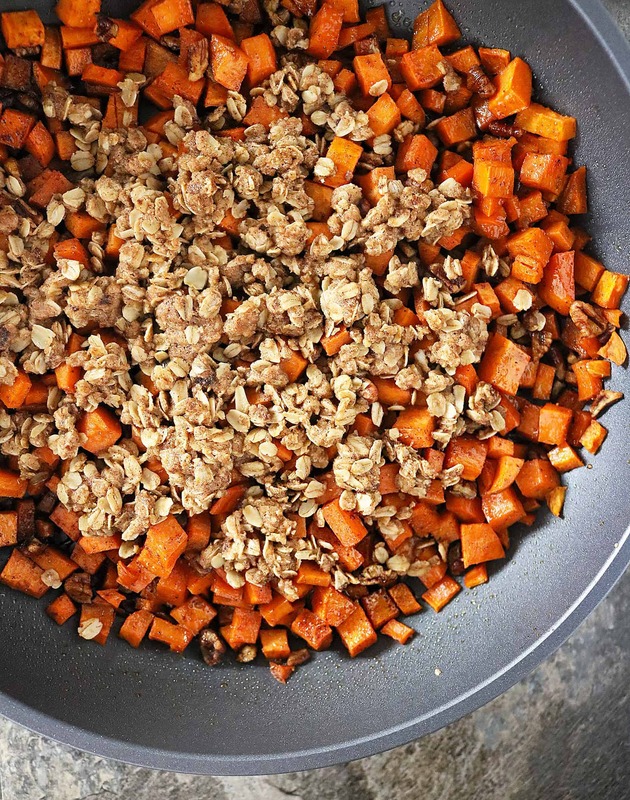 My Anolon® Accolade 12″ deep skillet made preparing this better-for-me, Sweet Potato Streusel Bake a cinch to prepare. With the beginning of the holiday season, I wanted to try to come up with a substitute for sweet potato souffle. My aim was to use a rich, buttery, gluten free, streusel topping sparingly on a base of roasted sweet potatoes that were prepared without too much refined sugar or butter. 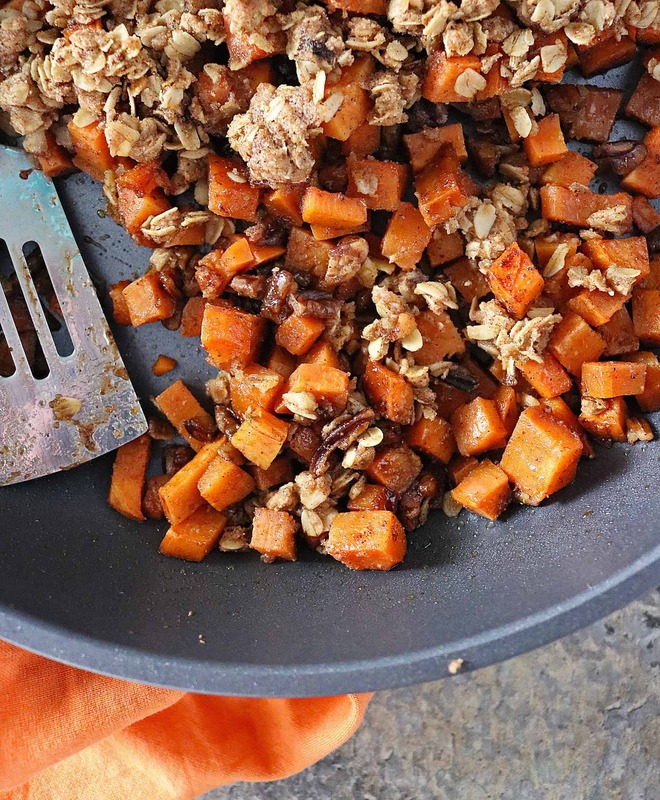 So, for this Sweet Potato Streusel Bake, I simple sauteed up sweet potatoes with coconut oil in my Anolon® Accolade 12″ deep skillet. I also added in maple syrup and spices. And, even though I stirred it sparingly as I was busy whipping up that streusel topping, there was no burning or sticking at all. I added a richer, gluten-free, streusel topping onto these maple cinnamon cardamom sweet potatoes and popped the skillet into the oven for about 30 minutes. As you can see, even with maple syrup, there was very little burning/sticking at all. The tender sweet potatoes paired beautifully with the crunchy, tasty streusel topping. You can enjoy this Sweet Potato Streusel Bake with some vanilla ice cream or whipped cream or straight up like my daughter and I did. If you are thinking of a new set of pots and pans for Christmas, I strongly urge y’all to check out Anolon®. Anolon® has had a proven track record since 1989. 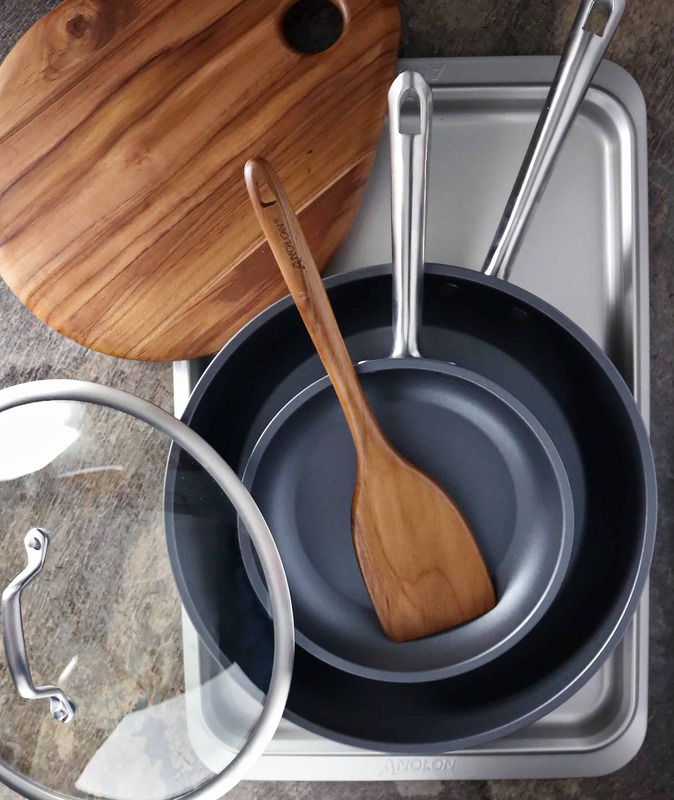 A quarter-century later, Anolon® is just as committed to making quality gourmet kitchenware that will inspire your personal culinary creativity. Anolon® knows that food, cooking, and eating connects us all and wants to inspire us to make those connections each and every day in our very own homes. Head on over to Anolon®‘s Facebook, Instagram, Twitter, and Pinterest channels to find out more about them! 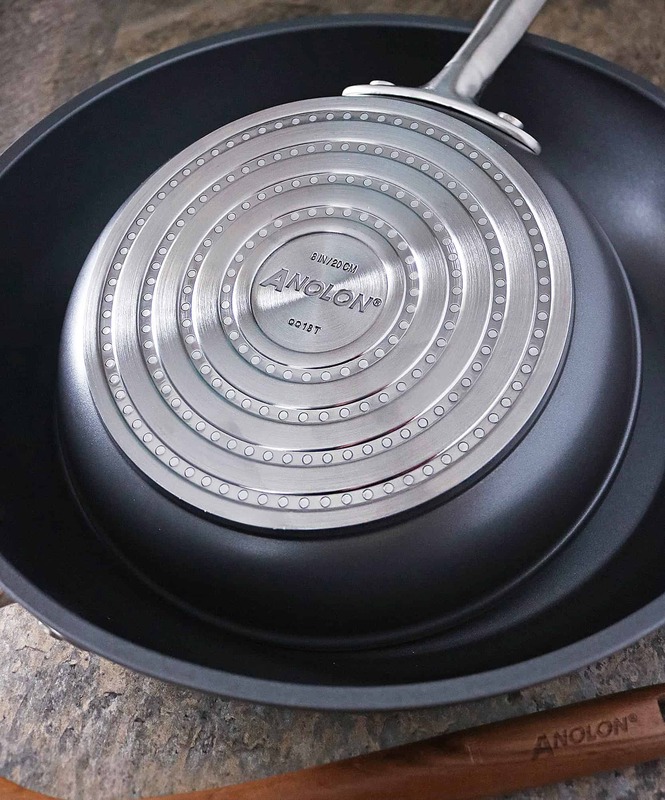 By the Way, Anolon® is hosting a GIVEAWAY where 5 of y’all can WIN your very own Anolon® Accolade cookware set! The giveaway is open to US residents only aged 18 and over. The giveaway will be live through November 30th 2018! 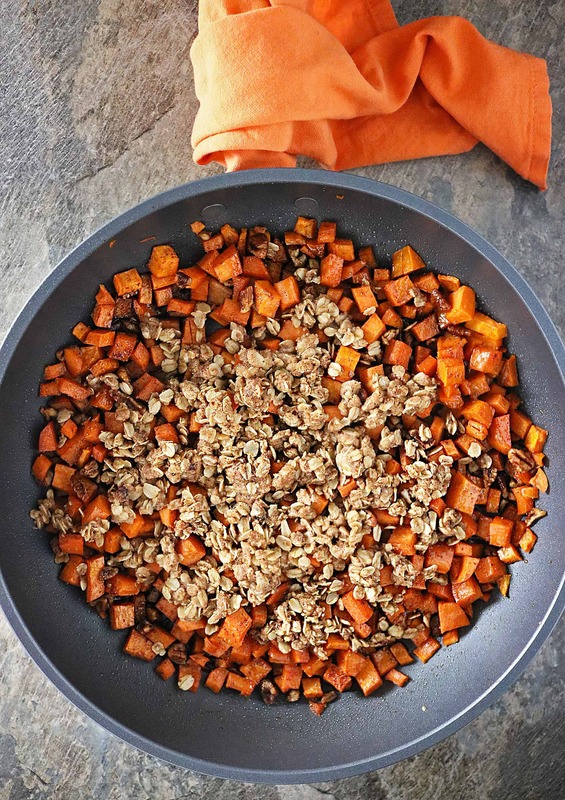 If you happen to make this Sweet Potato Streusel Bake, please do let me know your thoughts on it and, if you love it, please tag #savoryspin @savoryspin on social media so I can reshare it. You can also FOLLOW ME on FACEBOOK, TWITTER, INSTAGRAM and PINTEREST to get recipe ideas and inspiration. 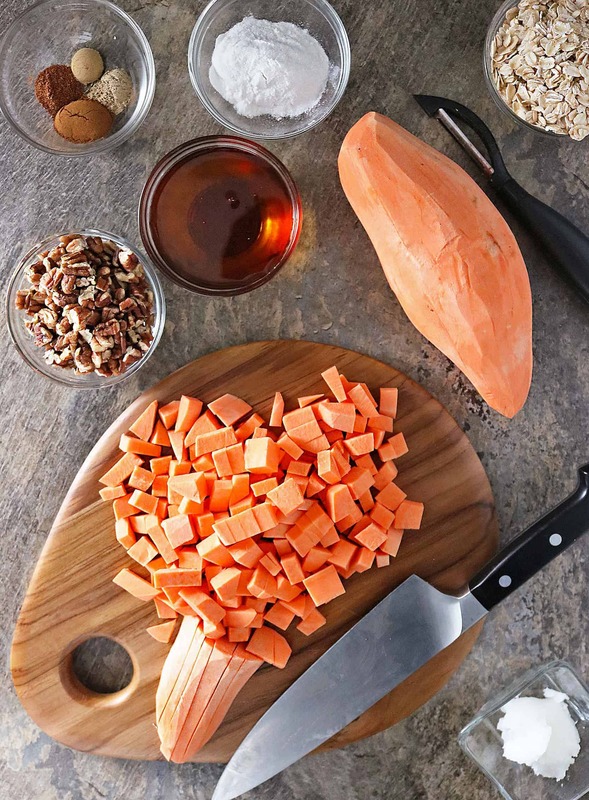 Add coconut oil to a pan over medium heat, and, when melted, add in the sweet potatoes along with maple syrup, pecans, cinnamon, cardamom, ginger, nutmeg and salt and stir well. Then let saute about 8-10 minutes. Meanwhile make the streusel topping by mixing together the oats, cinnamon, cardamom, gluten free flour, butter, brown sugar and vanilla and mix a bit. You will have clumps but this is the best part. 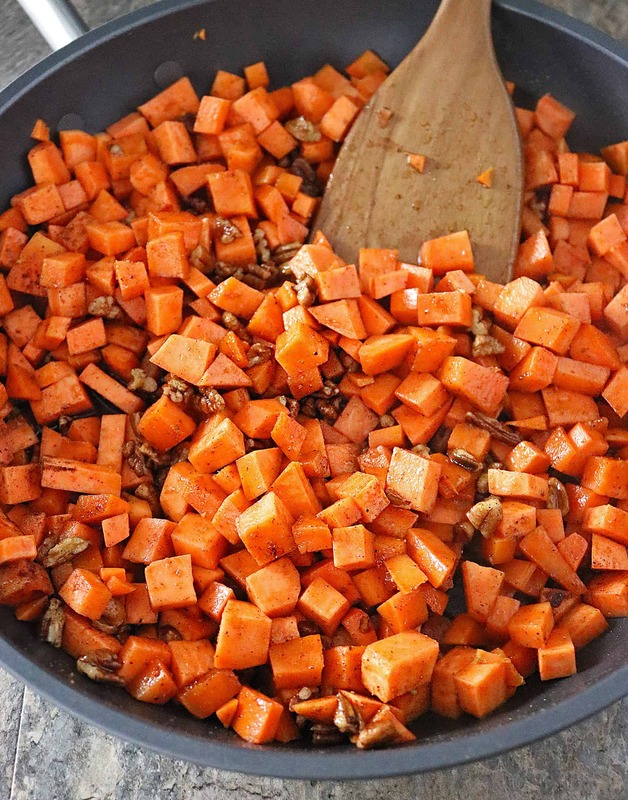 After sweet potatoes have sauteed about 8-10 minutes, remove them from the stovetop. Using a spoon or your fingers, add bits of the streusel topping on top. Place oven in pan and let bake 30 minutes at 375 degrees F.
When done, remove from the oven, let sit about 5 minutes and enjoy as is or with vanilla ice cream. What a unique and tasty dish Shashi. I suppose it’s OK to have this for breakfast too? It looks so tasty and with all those delicious spices I don’t think I could wait until dessert! Oh I am really loving this idea, Shashi! A good sweet potato souffle sounds amazing, but I love how you left these cubed and then added in that oat topping. Laura always likes to make potato skillet breakfasts during the holidays, but this is just a sweet version of that. I’ll have to try this out for sure! What a nice change from the classic sweet potato Thanksgiving dish. I love the streusel topping idea and cardamom is a loved spice in this part of the world. Forget Thanksgiving. I want this for breakfast tomorrow! 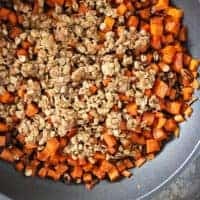 I’m obsessed with sweet potatoes and with crumb toppings and with all the spices you used here so I feel like you created this recipe just for me!